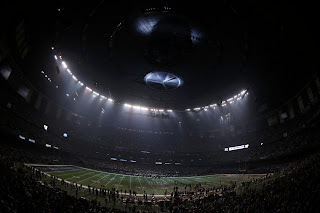 I hope there was somebody who took the over on the prop bet of 0.5 power outages during Super Bowl XLVII. Indeed, early on in the third quarter, there was a power surge at the Mercedes Benz Superdome during the game that lost for around 40 minutes. It certainly was a major turning point in the game as the 49ers, who had looked like crap for the first half, was able to turn it around to have a shot at winning late in the fourth. The power went out in the CBS broadcast booth, meaning the network had to rely on sideline reporters Steve Tasker and Solomon Wilcots for updates, and both did tremendous work. On the radio side, Kevin Harlan had to broadcast via phone. It was one of the most bizarre moments in Super Bowl history, for sure. Take a look at the initial confusion when the lights went out.